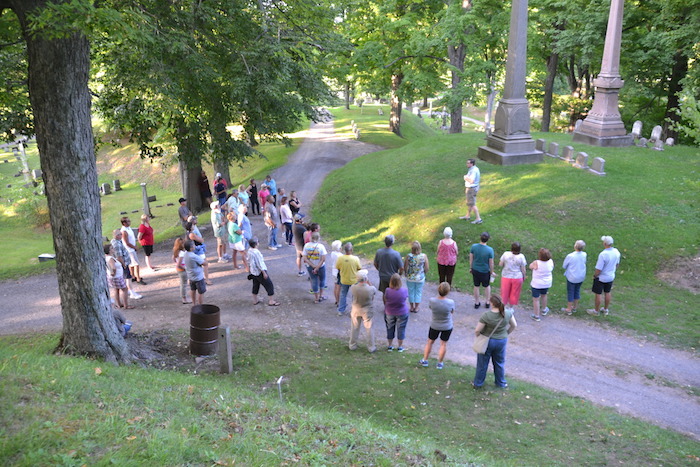 Photos by Tom Rivers: Orleans County Historian Matt Ballard leads a tour of Mount Albion Cemetery on Sunday evening. Ballard is pictured at the grave of Lorenzo Burrows, who established a bank in Albion, served as the county treasurer and was the state’s comptroller from 1856 to 1857. He also ran unsuccessfully for governor. About 40 people attended the tour on Sunday. ALBION – The first-ever Orleans County Heritage Festival is less than two weeks away – Sept. 9-11. The festival will focus on four themes – Agriculture, Transportation, Historic Gems and Historic Cemeteries. One of the four themes emphasized this year is Historic Cemeteries. 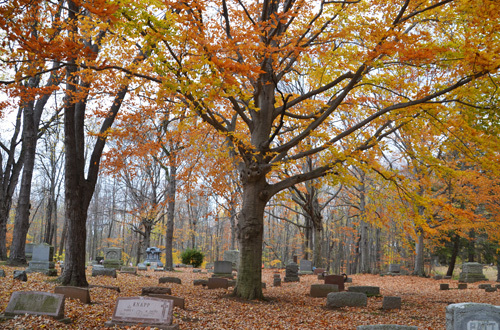 Participating cemeteries include: Beechwood and Greenwood in Kendall, Boxwood in Medina, Hillside in Holley, Mt. Albion and Union Cemetery at Watt Farms – both in Albion. Beechwood Cemetery on Woodchuck Alley in Kendall was established in 1828. Cemeteries are a rich source of local history and culture, if people take the time to appreciate them, said Derek Maxfield, a history professor at Genesee Community College and one of the chief organizers of the Heritage Festival. The cemetery art contained on the many grave stones contain information about families, military service and values. The symbols and iconography give us a window into the culture of the time, he said. Several of the participating cemeteries this year will give people the opportunity to learn more about these wonderful outdoor museums, Maxfield. At Boxwood Cemetery in Medina, Village Historian Todd Bensley will lead tours on Saturday (Sept. 10) and Sunday (Sept. 11) beginning at noon and 2 p.m. There is no admission charge. Mt. Albion will also feature cemetery tours led by former Orleans County Historian Bill Lattin. Tours will be led on Saturday (Sept. 10) from 3 to 5 p.m. and will begin every half hour from the chapel. There is no admission charge. The chapel at Hillside Cemetery in Holley/Clarendon will be open for tours on Sept. 10. The cemetery is listed on the National Register of Historic Places. 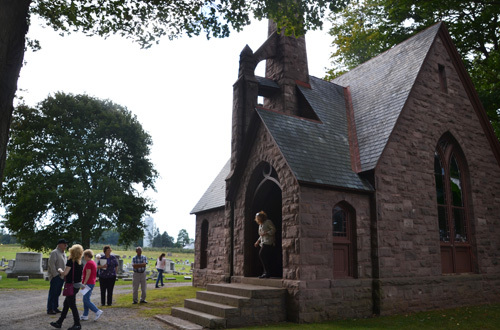 At Hillside Cemetery in Holley visitors can take a self-guided tour on Sept. 10 of the remarkable Gothic Revival chapel built in 1894 and cemetery from 9 to 11 a.m. – beginning from the chapel, and/or go on a “Ghost Walk” in the evening. Established in 1866, the cemetery has a split personality. The older section of the cemetery reflects the romantic era of antebellum America and Guilded Age of the late 19th century. The newer section reflects the Lawn Cemetery style of the twentieth century. The Clarendon Historical Society began raising money a few years ago in an effort to preserve the beautiful chapel at Hillside Cemetery. The “Ghost Walk” on Saturday (Sept. 10) will benefit the restoration fund. Walks will begin from the chapel at 7 and 8 p.m. Admission is $10 per person. Among the fascinating “ghosts” will be Carl Akeley, the famed taxidermist, who will be portrayed by Tom Rivers, editor of the Orleans Hub. Also featured will be Francis Cole, who was a POW for 29 months during World War II, and Jewell Buckman who had the distinction of being the first local soldier killed in World War I. The cemeteries in Kendall, Beechwood and Greenwood will feature self-guided tours from 10 a.m. to noon on Saturday (Sept. 10) as will Union Cemetery at Watt Farms in Albion. A brochure will be available at the Watt Farms Market which will highlight the graves of veterans of the War of 1812 and the Civil War. Folks interested in American death ways will want to check out events and exhibits at Genesee Community College’s Albion campus center. “Death, Mourning and Justice in Orleans County” will feature a recreated wake in a Victorian parlor. A beautiful glass casket from the late 19th century will be on display. 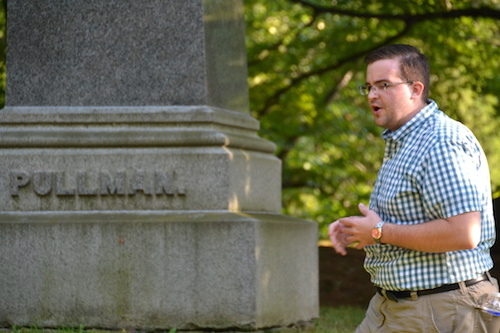 Matt Ballard stops at the Pullman family grave at Mount Albion on Sunday. James Lewis Pullman, father of sleeping car magnate George Pullman, is buried at Albion’s historic cemetery. There will also be two public lectures at the Albion campus: at 11 a.m. Orleans County District Attorney Joe Cardone will speak on famous crimes and murders. Lattin, the retired historian, at noon will talk about Victorian memorials featuring human hair. There is no admission charge for any GCC events or exhibits. Visitors who wish to take advantage of the great opportunities afforded by the Heritage Festival should begin by procuring a festival brochure, which is available at all participating organizations and from GCC campus centers in Albion and Medina. A list of participating organizations is available at the festival website (click here). Once the brochure is in hand, participants are encouraged to visit at least three locations to be eligible for prizes. As guests visit each location, they will be provided with a colored ribbon. Once they collect three ribbons of any color, they are eligible for a collectable button featuring artwork that reflects the four themes. They also become eligible for a drawing for prizes. For more information about the Orleans County Heritage Festival go to orleansnyheritage.com or contact Derek Maxfield at ddmaxfield@genesee.edu.